It seems to me that the sky has opened and I believe there is a very good reason why I’m just stumbling upon such great information this week in particular. I’m pretty sure that within the next two weeks, I’ll have reviewed both the 1837 and 1856 African American Quaker censuses. I’m hopeful that I will find my 5th great grandfather in the 1837 index. However, any find for this time period, whether my ancestors are indexed or not, is GREAT find in my opinion. Hopefully, one day this information will become useful to someone. Among many historical institutions in Philadelphia, Mother Bethel is one of the most influential in African American religious life. In the past few years, on a site used as a municipal playground, the old Mother Bethel burial ground has been found. After a campaign, the site will be preserved and not desecrated for development. Also, this site could prove VERY valuable for research purposes. So while burial ground site may not have any specific resources pertinent to me, in a general sense, it may help me build a better portrait of my ancestors on a broader level. Terry Buckalew has created an index of African Americans buried in the Bethel Burial Ground. The list is not complete but it does offer nice details, akin to what we might find on a more contemporary death certificate, i.e. cause of death. Below is a description of the index with a link to the index. I’d been excited about this census since learning of its existence while reading “Forging Freedom: The Formation of Philadelphia’s Black Community, 1720-1840“, by Gary B. Nash. I knew it was accessible either at the Historical Society of Pennsylvania or the Friends Historical Library at Swarthmore College. I’m very pleased that Ancestry.com continues to add to content to their product. I’ve found so much in the last few months, including this census and previously unavailable death certificates. To begin, the documents are very difficult to read on Ancestry.com. AND there is a wealth of information contained in this census. I was excited about it prior to getting my hands on it but when I realized the details of what is actually contained within this census, I’m floored, flabbergasted but grateful. I’ve had one nagging question about my 5th Great Grandmother, Catherine Little, born in 1788 in New Jersey. Since this time period was in such flux as it related to person-hood in both Pennsylvania and New Jersey, I could not assume that she was born free, enslaved or served an apprenticeship. I’ve struggled with developing a research plan because I do not know which county she originated from in New Jersey. IF you are fortunate enough to have an ancestor interviewed in this census, feel blessed because it is very rare for us to have this information, particularly during the antebellum period. Thank you Friends Society! In 1847, Catherine Little lived with two other people in her household. She was the head of household living with one male and one female. Catherine was over 50 at the time and this is noted in the census. The other two people living with her were under 50 but I would assume over 15 as this is not marked on the census. All three of the members of Catherine’s household were born in Pennsylvania and none were intemperate. All three could read and write. The male worked as a waiter. At least one of the females worked twice a week but the occupation is not listed. Other rich details include that two of the members of the family belong to a beneficial society (very common during this time), all three attended religious services and one of the household members belonged to the Temperance Society. These are wonderful details to help create a portrait of who Catherine was. 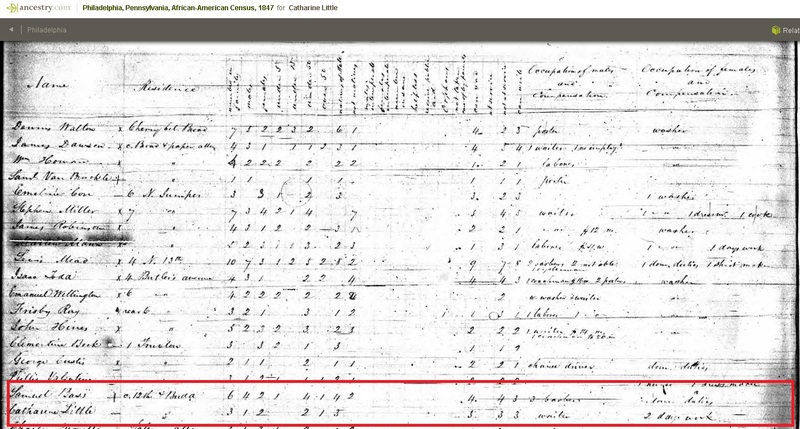 But to answer one of the most pressing questions I had regarding Catherine Little: according to this census, she was not born enslaved. I can’t wait to absorb this all and bookend it with the 1840 and 1850 censuses for Catherine and her children. I need to also explore the Bass connection. The Bass brothers and my ancestors resided together for several years. What might I uncover following the Bass line of research, I wonder. What can proximity tell me, if anything? As always, I’m looking for anyone who has ancestors to research who were African Americans in antebellum Philadelphia. Please spread the word. Thanks! While doing some research this morning, I notice that Ancestry.com has a promotion and portal for Quaker records. I’d recently become aware of the Quaker census of African American in Philadelphia. I’ve not had the opportunity to track this down at the Historical Society of Pennsylvania but I’m pleased to learn that the documents are available online via Ancestry. So if you have ancestors who may have lived in Philadelphia in 1847, let me know. If I can find some information for you, I will share if you do not have an Ancestry subscription. The Philadelphia Monthly Meeting of the Society of Friends (Quakers) commissioned this census of thousands of free African American families and individuals living in six areas of the Philadelphia. This was done in order to further their efforts to help the African-American population of the city. The census includes information on a variety of social variables. Included for each family: Name of head of household, household size by gender and age; street address; employment and compensation of everyone working in the home; children’s schools; value of personal property; whether members were born in Pennsylvania, debts, taxes, ability to read and write, how many family members were born as slaves and how much they paid for their freedom (and to whom, when known). Although this census excludes the substantial number of African Americans living in white households, they provide data not found in the federal population schedules. When combined with the information on African Americans taken from federal censuses, it offers researchers a richly detailed view of Philadelphia’s African American community in 1847. I hope I find some ancestors in this file as I’ve often suspected I would. I’ll spend some time combing through these documents. I’ve been a little busy with other projects but I must finish the census of Free Philadelphians with trades. I hope someone is finding this information useful. As always, I’m looking for other genealogists who have an interest in this time period. If you know of anyone, please let me know.